A secluded, wooded, very scenic year-round low maintenance vacation property located 20-30 minutes by car from Madison. 165 feet (approx.) frontage on the Rock River with boat access to the 10,000 acre Lake Koshkenong. Level lot. Cedar and Flagstone sided Cabin with 2 large Bedrooms, Four-season Sleeping Porch, Great Room layout with eat-in Kitchen. Also includes rustic Bunkhouse with two wood bunks and room for two camping cots. Boathouse/Boatlift with Cover/Boat Pier and additional Boat/Swimming Pier with Ladder and Bench. (Piers can stay in water during the winter months.) Two Rustic Garden Equipment Sheds. Family Owned for 30 years. Optional: Available furnished-price negotiable (Coordinated bedding linens, kitchenware, etc. Also available: Pontoon Boat and Trailer/Powerboat and Trailer/2 Waverunners and Trailer/Aluminum Fishing Boat with Motor/Canoe.) No brokers. Everything is ready for the new owners to move and start enjoying! At this cozy retreat in the rustic woods along the beautiful Rock River, you will enjoy an unparalleled vacation experience. Boating, water skiing, swimming, kayaking and canoeing are yours to enjoy on the gorgeous Rock River and the adjacent 10,000 acre Lake Koshkenong. And the winter months offer opportunities, for snowmobiling on the areas many trails, ice fishing on the lake, and many other cold-weather activities. Many dining and entertainment attractions are also available along the shores of the Rock River and Lake Koshkenong. And charming Edgerton offers small town friendliness, with antique hunting a special pleasure in this lovely village and in the beautiful towns nearby. Break in the Weather parties, Chilimania, and the renowned Thresheree are among the many special events held in this area each year. The cabin, owned by the same family for more than 30 years, offers an open floor plan with spacious living room and eat-in kitchen, charming bathroom with tub/shower combo, two spacious bedrooms (the front bedroom has a large picture window overlooking the front patio and the river), and a scenic sleeping porch with two walls of windows, also overlooking the riverfront. This lodge-like home includes central forced-air natural gas heating; ceiling fans and window A/C units keep cool in the summer. And of course the river is just steps from your door for a quick cooling off with a refreshing swim. Cable/internet is available, or connect to the installed antenna tower to receive free local television programming. 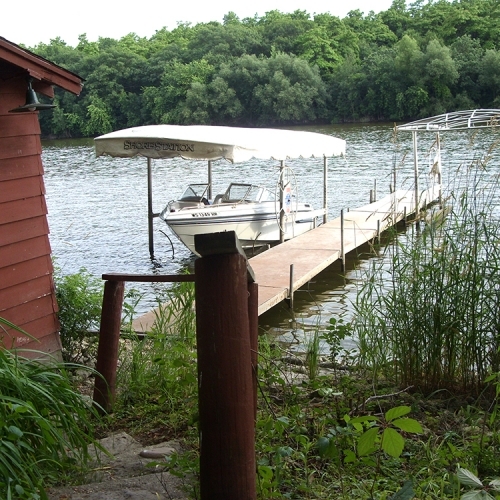 The wooded property offers approximately 165 feet of shoreline, with boat docking pier with covered boat lift, and a swimming pier with bench and swim ladder. Near the boat pier is the boat house, with a track set up for storage of two jet skis. There is also a rustic bunkhouse, with two wooden bunks and room for an additional two camping cots. An authentic vintage outhouse (decommissioned!) from an old railroad station and attached shed provide storage for lawn and garden equipment. Wood-burning barbeque grills serve up tasty meals, and a campfire pit hosts bonfires as part of an evening tradition. Abundant wildlife accustomed to human neighbors enhance the surrounding woods, where Native Americans once lived. The sounds of bullfrogs and owls echo through the trees. Deer meander along the shore at dawn and dusk, under the watchful gaze of great blue herons. There are frequent sightings of beavers, badgers, otters, raccoons, rabbits, chipmunks, and even the elusive flying squirrel. The River and Lake host many species of fish, who share their habitat with frogs and turtles. And in the skies above one can watch hawks and gulls and even the occasional bald eagle catching rides on the thermal air currents. The property is bounded on one side by the tracks of a local short run train. The rails are elevated on a wooded embankment away from the property and do not compromise safety or obscure any waterfront views; the raised embankment actually contributes to the privacy of the Property. Only a few trains pass by on a weekly basis; one or two a day and not every day. But it is a treat when they do, especially for the younger visitors; and occasionally a historic train with vintage equipment, or the circus train on its way to winter headquarters in Baraboo, will have everyone snapping photos with their cell phones and cameras. The Cabin is located 90 minutes from Ohare Airport, an easy drive on Interstate 90. The southern Wisconsin Regional Airport is located in Janesville, 20 minutes south off I-90, and Madison, the Wisconsin state capital is just 20 minutes north on I-90. 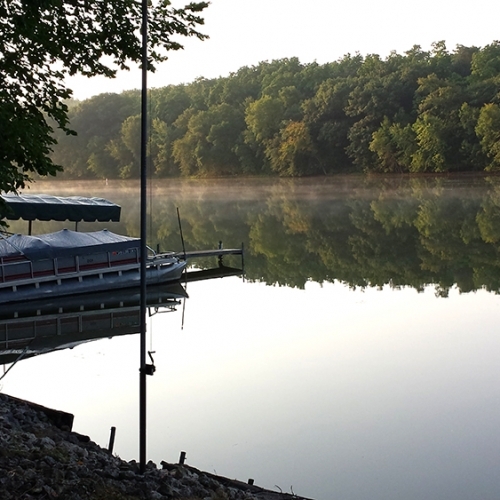 The Cabin on the Rock River offers an enchanting getaway for the whole family and an unforgettable, nature-blessed vacation experience far from the ordinary. This is not just a vacation property, it is a unique experience, offering a wilderness and wildlife waterfront +river setting with all the nearby amenities of in-town shopping, dining, entertainment and medical facilities within a ten-minute drive; easily accessible via the interstate highway system.